Speaking to the European Parliament, Jean-Claude Juncker categorically ruled out any re-negotiation of the Paris climate agreement. The European Commission President said: "We have spent 20 years negotiating", and now was the time for implementation. US President Trump has claimed that the accord could be amended and made more palatable to his country. Mr Trump announced earlier this month that the US would leave the pact. In his remarks to MEPs, Jean-Claude Juncker described the US decision as not just a sad event, "it is a sign of abdication from common action in dealing with the fate of our planet". The US "abandonment" will not mean the end of the agreement, he said, but would make the world more united and determined to work towards the accord's full implementation. He was very clear there would be no attempt to amend the agreement. "The European Union will not renegotiate the Paris Agreement," Mr Juncker said. "The 29 articles of the agreement must be implemented and not renegotiated. Climate action does not need more distractions. We have spent 20 years negotiating. Now it is the time for action. Now it is the time for implementation." The president of the Marshall Islands, Hilda Heine, also addressed the parliamentarians, meeting in Strasbourg. She re-iterated her view that the Paris agreement was set in stone. "We cannot do better (than Paris), and we don't have the luxury of more time," she said. She urged the EU member states and other countries to use the three years before the US pulls out of Paris to try to convince President Trump of the importance of climate action. She also called on Europe to adopt harder goals when it comes to cutting emissions of carbon dioxide. "We will not stay within 1.5C unless Europe and others move before 2020 to raise ambition." The bloc should adopt five-year climate targets instead of the current 10-year plans, she said. By a huge majority the EU Parliament voted on Wednesday in favour of binding national targets for cutting emissions from areas including transport, agriculture and waste management. These areas are not covered by Europe's emissions trading scheme. The move forms part of the EU's strategy for getting emissions down by 40% in 2030 below 1990 levels. "Today's vote gives a crystal clear signal to Donald Trump: Europe acts on its commitments under the Paris agreement and seizes the opportunities of green growth, with or without you," said Gerben-Jan Gerbrandy, the Dutch MEP who helped guide the law through the parliament. 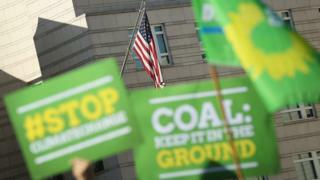 "Almost all political groups have backed a strong and ambitious climate law."